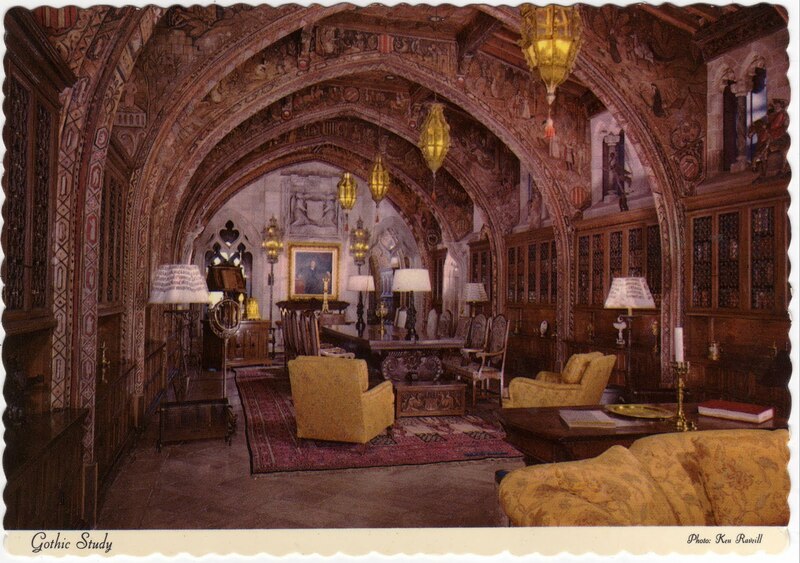 This postcard of the gothic study in California's Hearst San Simeon State Historical Monument by Dexter Press1 of West Nyack, N.Y., was copyrighted in 1966. Portrait of William Randolph Hearst hangs at the far end of the GOTHIC STUDY in La Casa Grande2. It was from here that Mr. Hearst directed his vast business empire. Rare books are housed in the ornate shelves. Newspaper magnate Hearst had his estate -- which has been referred to as Hearst Castle, La Cuesta Encantada and San Simeon -- constructed between 1919 and 1947. It featured 56 bedrooms, 61 bathrooms, 19 sitting rooms, 127 acres of gardens, indoor and outdoor swimming pools, tennis courts, a movie theater, an airfield, and the world's largest private zoo. San Simeon was the inspiration for the Xanadu mansion (pictured at right) belonging to Charles Foster Kane in the 1941 movie "Citizen Kane". Hearst, furious because this and several other aspects of the film seemed to be about his life, angrily attacked Orson Welles' film on several fronts through his media empire. Tours of San Simeon are available. Sightseers might have the fortune to glimpse zebras -- descendants of Hearst's original zebras -- roaming freely on the grounds. 1. Dexter Press also produced last Saturday's Dealey Plaza/JFK postcard. 2. La Casa Grande, the castle on Hearst's sprawling estate, is 60,645 square feet.